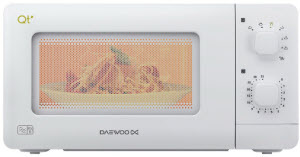 Find out which is the best small microwave for your kitchen! This was one of those situations. It had to go in the corner next to a cupboard but with enough space to the side for a chopping board. After that was a sink meaning no room for maneuver there. This is the problem when you have a tight kitchen. Limited space means the only real option is to buy smaller appliances. I work for myself and tend to use the microwave quite a bit at lunch times, whether for noodles, baked beans or to warm up a chocolate cake! I’m sure other self-employed people will know what I’m talking about. Decent lunches is one of the pleasures of working from home. Before we get on with this please note this article is strictly for visitors in the UK. Lots of people come to this website from all over the world, I just wanted to make it clear these kitchen appliances are only available to buy in Britain. Now that’s done, let’s get on with it! 1 What’s best for you? As soon as I started looking I realized this was an opportunity for a blog post! There is some information out there specific to buying small microwaves but I didn’t find it very useful. I knew I could do a better job so here goes. 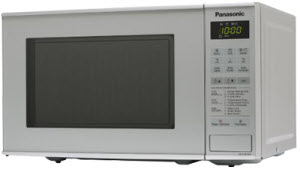 For this free guide I’ve looked at lots of different small microwave ovens and compared the sizes of them. Pictures are included because design is also still important. Unfortunately, I found price couldn’t be one of the key criteria in the decision because size and design are the key things in this scenario. Admittedly that is quite annoying when you’re in a rented property but such is life! 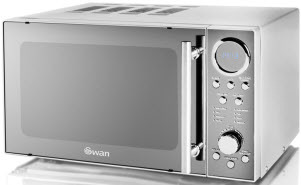 We all have different needs and tastes so this article doesn’t feature a conclusion of, “the best small microwave oven is…” That won’t work, what is best for you is not ideal for somebody else. One person may be buying for a caravan whilst another is buying for a tiny London flat. With that in mind let’s take a look at the final shortlist and do this. A look at the brands and what size they are. All were for sale at time of posting, check retailer for availability right now. Time to get your tape measure out and have a look at the space you will be putting the appliance. The decision is a lot easier once you have a rough idea of what the maximum width and height. If the useful table above is enough information for you then you can go ahead and click the retail links to find out more including reading real reviews from users specific to those products. If you are still unsure here I will now look more at each one as an overview rather than an in-depth review. Now that quick overview is out of the way I’m going to look a bit more in-depth at each one. If you can’t be bothered with me blabbering on you have the links in the table, they all go straight to Amazon for simplicity and they are often well priced. Remember, if you are unsure and can’t be bothered with returns then please don’t buy one online. Go to a physical retailer and take a look at them in more detail. Sometimes being able to touch them and see in the flesh can help you to make a decision. There is a nice mix here so hopefully this gives you a really good hand in deciding. If you like the look of any of them click on the product photograph to visit the e-commerce seller. This microwave has been around a very long time and appears to be as popular as ever. It has 600 Watt of power. A simple white design featuring the controls on the right side, they have a rounded square shape which is distinctive in comparison to similar white goods. Also available in light pink should you have a colour scheme that demands that! If you have a bit more to spend there is also the QT2 which is around £15 more expensive. Huge amount of positive customer reviews for this one, solid performer! I think this is arguably the smartest looking model relative to the cheap price. Has 700W power output, a 17L capacity and utilises a button and dial operating system to pick your timings. Very slick looking black design, will look excellent in smart and modern kitchens. A brand that you be less familiar with compared to other rivals listed here. If you like the polished chrome look this will be right up your street. My only worry would be getting fingerprints on it. Regular cleaning would be required to keep it spotless. Well worth the effort if you want a bit of bling in the kitchen. Not ideal if you are slightly lazy in the kitchen. If you are vain this has a full mirror on the door, you can heat up your baked beans (or marshmallows) and check your hair at the same time! Multi-tasking at its finest. 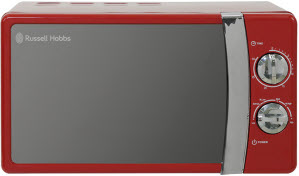 Red microwaves are very popular, this one has a very rich red colour to it that will really stand out in your humble abode. Be careful to have a kettle and toaster that relatively match though otherwise it could all risk looking a bit busy on the eyes. Also available in cream and black if you want it in those colours. The dial design and overall look is very nice on this model. In order to show you a fair mix of styles I’ve also included this one. 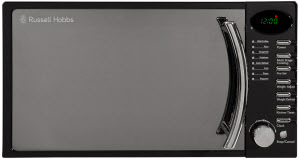 It also has one of the smallest widths out of any of the small microwave ovens featured here. The white box heavy shape of this may not be to everyone’s taste but this is still very popular. The good thing is the buttons are very easy to use on this one. Arguably the most user-friendly featured here. I hope this resource has been useful for you and helped you to make a decision on the one to buy. I’ve found it good fun to take a situation I found myself in and turn it into something useful like this. If anybody clicks thru the amazon links and buys a product I get a small commission. If I get a few conversions it might make it worthwhile doing more content like this that may be underserved by other online web properties. I will see how it goes and write based on what happens. If you have any ideas for other gadgets around the home send them in because I love writing for this blog and would love to be given ideas! Happy hunting and I hope whatever small microwave you buy looks great in your kitchen. If you are a bargain hunter be sure to check eBay or Gumtree if you aren’t bothered about buying used. If you are a money-saver don’t forget to look at retailers on websites like Quidco as well to see if any cashback is possible. This post will be updated over time, all the products featured were for sale in the UK at the time of posting. Updates will be done to reflect market changes over time. Happy cooking my friends.